Liberally spray mini donut pan with nonstick cooking spray. In a large mixing bowl, combine cake mix, egg, water and vegetable oil; stir well. Place batter in a piping or plastic bag with the tip cut off and pipe cake mix into donut pan. Bake for 7-10 minutes or until toothpick inserted comes out clean. Remove from oven, allow to cool for 3 minutes in pan and carefully transfer to cooling rack. To make glaze, whisk together powdered sugar, cocoa powder, milk and vanilla until smooth. 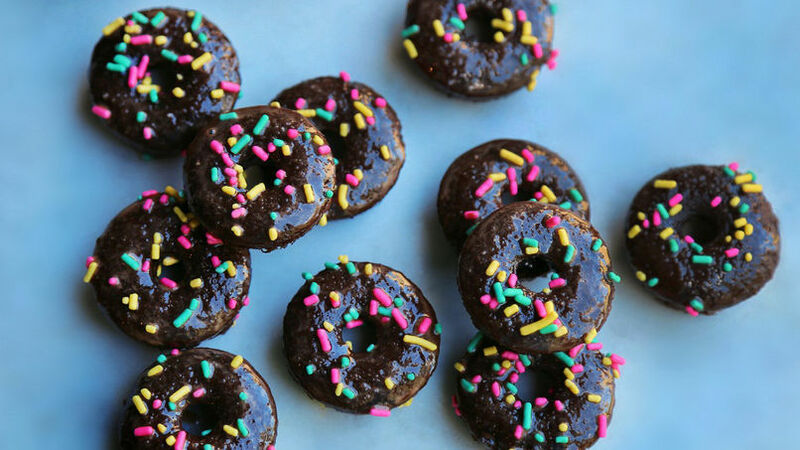 Dip each donut into chocolate glaze, garnish with sprinkles and return to cooling rack to set. Use any cake mix to make these tiny donuts or use a regular size donut pan for larger sweet treat. Decorate with toasted coconut, min chocolate chips or chopped nuts. These mini donuts will be the hit at your table. With the help of Betty Crocker™’s delicious cake mix, these small bites are too cute to pass up!